First thing everyone wants to know right? How much? Unlike most companies, we aren't hiding that info from you. And frankly, if you consider all that we give you, starting with the absolute finest wedding imagery available, with no time limits, we're easily the best photo and video value in the area....and it's not even close. Ours is all inclusive, and everyone else is by the hour so you end up getting nickel and dimed which ends up costing you way more than our simple pricing would have. For 2019, we've changed the definition of wedding photography pricing and added video coverage. We've totally simplified things. EVERY BRIDE now gets our new NextGen plan starting at the same price as our previous coverage only plan! 1. No time limits, we are there from the time you get dressed till the end of the party. 3. Our exclusive and unique Infrared coverage. 4. A slideshow of images FROM THAT DAY shown during your reception! 5. 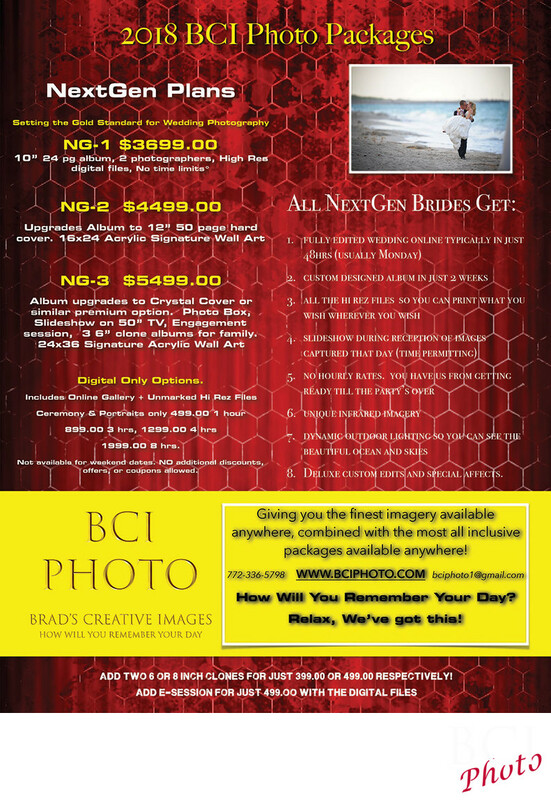 Your FULLY edited wedding will be online the Monday following your wedding. 6. Your Photo cover, custom designed album, will be in your hands in approx. 2 weeks! 7. The high resolution images so you can print what you want. 8. Our dynamic lighting both indoors and out. 9. Up to 12 hours of expert editing, making your images the best they can be, including many of our own signature edits that nobody else comes close to. 11. A fresh new approach to video capture unlike any other. Act right NOW and save $1000 off the NextGen package of your choice or get $1k towards your Video Coverage! Video coverage is the perfect accompaniment to any photo package. By using us for both you never have issues with one team running into the other as usually happens when you have two competing companies trying to get the same shot. We work together. We are known for our unobtrusiveness and would never position ourselves between your guests and the action so you know we will be as discreet in our efforts as is possible. Please note our Super Special listed above as you'll get a huge savings from the regular prices, and is only available for the first 10 clients to book. Call or text us today, as available dates do fill up quite quickly. Our new Selfie Stick Photobooth which lets your guests use their won cameras and iphones to play with our red carpet hollywood style backdrop complete with props and loads of fun. Engagement Sessions : Which now include the digital files! 6 or 8" clones of your album! Very inexpensive, and make great gifts! TIP: On the BLOG: enter your venue (ie Jupiter Beach Resort) in the search box, and it will show you all the weddings we've shot there and in our client area, there are no passwords needed, so you can see the work we produce every week, is better than most companies portfolio shots. Thats just the way we roll. Having a smaller wedding or off season? Ask us about our mini packages. *prices listed subject to availability, and include all available incentives. and can not be combined with any other promotion.